YouTube TV is now available on Roku, adding more competition to an already-crowded field of live TV streaming services dominated by Sling TV, DIRECTV NOW, and PlayStation Vue. While YouTube TV doesn't stand out in terms of price and channel lineup, it does offer an excellent user interface and some nice bonuses like unlimited cloud DVR and six logins per account. But don't look for it on the YouTube channel, it's on a whole new YouTube TV channel. Where YouTube TV does stand out, though, is with its well-designed user interface and added features. Here's a rundown on what stood out, both the good and the bad, after spending some time interacting with the channel. Live and on-demand content - While YouTube TV touts the live TV aspect of the service, you'll also find plenty of on-demand content. There are past episodes of many shows, and quite a few movies that include box-office hits like Titanic (1997), Fifty Shades of Grey (2015), and The Maze Runner (2014). Don't expect a library to equal Netflix, though. There are only 50 titles in the action genre, 117 comedies, and 118 dramas (there are several other genres to choose from as well), but you'll recognize a lot of the titles in the movie library. Multiple logins - Each YouTube TV account allows up to six logins, so your personalized recommendations and DVR recordings won't get mixed in with others in your household. This feature is called "family sharing" and requires you to set it up through the YouTube TV website or mobile app. After activating family sharing, the "family manager" can invite up to five family members in the same household to join the family group. Family sharing is part of Google For Families, which allows sharing of other Google services like Google Play and sharing of calendars and photos and videos. This is fine if your family is already highly integrated in the Googlesphere, but I would prefer the Netflix approach that lets you instantly set up a new profile directly through the Roku channel, making it easy to add and remove profiles for visitors. Personalized recommendations - Like other streaming services, you'll get personalized recommendations based on your viewing habits. The more you watch, the more Google will know about you. And that hopefully means better recommendations. I haven't been a YouTube TV user long enough to comment on the relevance of recommendations. Unlimited cloud DVR - Unlike Sling TV, YouTube TV does not charge extra for cloud DVR, and they allow unlimited recording. And unlimited is good, because if you select a show to record, YouTube TV will record every airing of every episode in perpetuity (or until you cancel it). There are no options to record only new episodes, or episodes on certain channels. 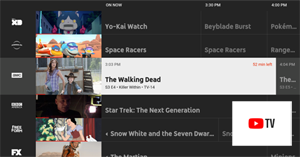 But if recording options are limited, YouTube TV does have a nicely designed Library for managing and viewing recordings, with categories for new episodes, most watched recordings, and sorting by type (shows, movies, sports, and events). Program-related information - When searching or browsing shows, select "more information" and you'll find a lot of related information. In addition to being able to record it (select "Add to Library"), you'll find upcoming broadcasts, a synopsis of the shows, and a list of the leading cast members - complete with real name, character name, and a headshot (select a cast member to search for other programming that includes this person in the billing). You'll even be able to watch related YouTube videos and browse content similar to the selected show. Background streaming - Good or bad? It depends. It's obviously good if you want to continue streaming while browsing the channel for other content, but the video is barely visible behind the channel interface while you do this, so the main advantage is that you can still hear the soundtrack. Background streaming is annoying, though, if you started streaming a show that you don't want to watch. I was unable to find a way to cancel out of a stream once it started - the selected show will continue streaming until you select a new show to stream, or give up and hit the Home button on your remote to go to the Roku home screen. Avoid this annoyance by hitting Pause on your remote before trying to back out of an unwanted stream. And here's a tip if you do want to continue watching the show that's streaming in the background: use your remote to scroll all the way to the top where you'll find the title of the current stream; select it to exit out of the YouTube TV interface and continue watching the background stream. According to Roku, YouTube TV is currently supported on all Roku TVs, Roku Ultra, Roku Streaming Stick+, Roku Streaming Stick (3800x, 3600x), Roku Express/Express+ (3910x, 3900x, 3710x, 3700x), Roku Premiere+, Roku Premiere, Roku 4, Roku 3 (4200x, 4230x), and Roku 2 (4210x). YouTube TV is also available on Apple TV, Chromecast, Xbox One, Android TV, and some smart TVs, as well as on mobile devices and computer. For more information, including screenshots, visit our YouTube TV Roku channel page.